Millions of people each year pass through large swaths of Montana on their way to Glacier and Yellowstone National Parks. Yet few visitors ever truly see Montana. Visitors to Montana typically arrive via the Interstate or the primary US Highways in the state, such as US 2 or US 93. This is unfortunate, as visitors who arrive solely to see Yellowstone or Glacier unknowingly pass right by scenery that rivals the National Parks, remote areas where emptiness stretches to a beautiful horizon and places that few people ever visit. While it’s true that many visitors to Montana are time pressed, many of the beautiful and rural spots in Montana lie, quite literally, just a few miles off the primary highways and can easily be driven through with a few hours to spare. Additionally, many other scenic and rural drives in Montana can be “stitched together” to allow for beautiful drives of over a hundred miles, providing the visitor with knockout scenery not far from the primary highways. 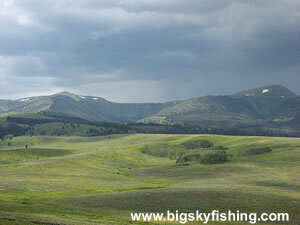 To help visitors see some of these remote and beautiful places in Montana, I’ve put together this section on Big Sky Fishing.Com. The scenic and rural drive section has one purpose – to highlight, through words and more than 1000 photographs and custom-made maps – the beautiful scenic and rural drives found throughout Montana. Most of the drives in this section of the site are “unofficial scenic drives.” By that, I mean neither Montana nor the Federal Government promote these drives in any way. For this reason, the names I gave to these scenic drives are of my own making. In other words, you aren’t going to find references to the “Centennial Valley Backcountry Drive” anywhere else but here, since the beautiful drive through the sprawling and empty Centennial Valley isn’t considered a “designated scenic drive” by anybody else. Before going on, it might be helpful for visitors to know the “metrics” I used in deciding whether to include a particular scenic or rural drive on this site. Please read the About the Scenic Drives page to learn why I consider some drives scenic and others I do not. Also, one helpful word here, don’t let the wording of a particular scenic drive turn you off on investigating it for possible inclusion for your next visit to Montana. The term “backcountry drive” doesn’t necessarily mean a four-wheel drive road, or even a dirt road for that matter. It just means that the scenic drive passes through a very remote region of Montana, where residents are few and services are non-existent. 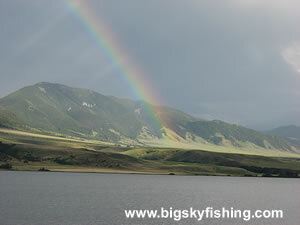 Overall, I hope visitors to Big Sky Fishing.Com enjoy this section of the site. With 44 scenic drives profiled, all with original photographs and custom made maps, it is my hope that visitors to Montana will find the urge to “leave the major highways behind” and venture off into some of the most beautiful and remote parts of Montana. If you enjoy this section of the site, by all means let me know. And if you take some the drives shown here, I'd love to hear your feedback about them, too. Finally, if you plan to venture off the main highways - and especially on dirt or gravel roads - buy a detailed map book, such as the Montana Road & Recreation Atlas. This book, in combination with a good Garmin DriveSmart GPS unit with good basemaps installed, prevents you from getting lost and helps you visit places few people ever do. Use this map to either jump to a specific drive, or click on one of the region links to view all scenic drives in a region of Montana. Use the following links if you wish to browse All Scenic Drives in Montana covered on this site (44 total) or to locate a drive near a specific town or city. To read short route descriptions for each drive, visit this page.